Since the tragic shooting at the gay nightclub Pulse in Orlando, Florida, many have taken to social media to express their sadness, their grief, their rage, and their support for the LGBTQ+ community of color that was targeted early Sunday morning. There has been an outpouring of sympathy and support for the families of the 49 people who lost their lives, as well as for the 53 others who were injured and remain in hospital care. And while many expressed their sorrow, their mourning, and their pride in posts and images, one Orlando doctor shared a devastating photo on Facebook. 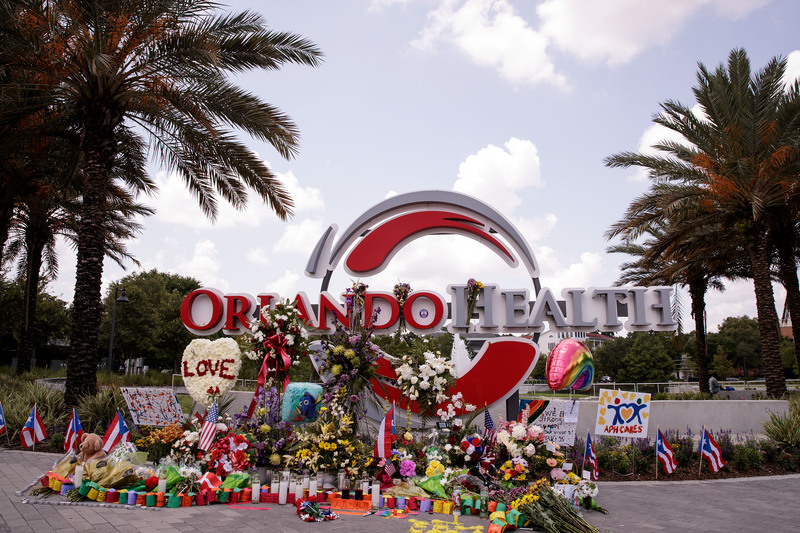 On Monday, Dr. Joshua Corsa, who is a senior resident at the Orlando Regional Medical Center near Pulse nightclub, shared a photo to Facebook about his experience offering medical attention to the victims of the attack. Corsa shared two photos: The first was of the shoes he wore when attending to the shooting victims; he said they were brand new, but in the photo they are soaked in blood. The second photo was of a pile of bloody scrubs, ones that were worn by the doctors who helped victims the previous night. Corsa's message is both important and moving, as he detailed what he saw that night and what he needed to do to help the people who were coming into the hospital. This blood, which poured out of those patients and soaked through my scrubs and shoes, will stain me forever. In these Rorschach patterns of red I will forever see their faces and the faces of those that gave everything they had in those dark hours.There is still an enormous amount of work to be done. Some of that work will never end. And while I work I will continue to wear these shoes. And when the last patient leaves our hospital, I will take them off, and I will keep them in my office. I want to see them in front of me every time I go to work. For on June 12, after the worst of humanity reared its evil head, I saw the best of humanity come fighting right back. I never want to forget that night. If you are interested in doing something to help out, you can donate to Equality Florida who is hosting an "official Pulse Victims Fund page" on GoFundMe. You can also help by donating blood and supporting Pulse, or offer support in other ways. You can see Corsa's original post here.